WILD ALASKA SEAFOOD - CATCH IT NOW! Unspoiled and pristine, bountiful and icy cold. Alaska manages over one million square miles of rich fishing waters against overfishing, habitat damage and pollution, ensuring abundant and wild seafood for future generations. Since 1959, Alaska's Constitution has mandated that "fish...be utilized, developed and maintained on the sustained yield principle" - making Alaska the first and only state in the U.S. to have such language written into its Constitution. Alaska's comprehensive fisheries management practices are recognized as a successful model of sustainability for the world. When it comes to heart and brain health, nothing beats the power of omega-3 fatty acids. And when it comes to omega-3s, nothing beats seafood. Especially seafood caught wild, like Alaska Seafood. That's because only seafood provides what might be called the most essential of essential fatty acids: EPA and DHA. What about omega-3s from plants like flax? Those come from another essential acid: ALA. Unfortunately, the body converts less than 1% of ALA into EPA - and only trace amounts into DHA. That's why omega-3s from seafood benefit the heart and brain in ways plant omega-3s cannot. They can improve circulation. Enhance the immune system. And even protect the body from certain cancers. Some of the seafood species with the highest levels of omega-3s come from Alaska: salmon, cod, halibut and sole/flounder. Now you can enjoy great flavor and health benefits at the same time! Alaska's unmatched flavor and quick cooking techniques are the reason dinner doesn't get much easier. There's no need to thaw frozen seafood portions - with these easy COOK IT FROZEN®! techniques, frozen seafood can go from the freezer to the table in as little as 15 minutes! Choose from the cooking methods below for fast and easy ways to COOK IT FROZEN®! Brush both sides of fish with high oleic vegetable oils: olive, canola, peanut, grapeseed, soy or safflower. Avoid butter, sunflower or corn oil as they will burn at high heat. 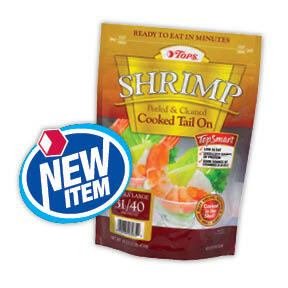 Serve up TOPS Colossal and Extra Large Shrimp: now cooked in the shell for a great, new taste! With rich, high-quality texture and deeper red color for eye appeal, it's ready to eat in minutes. Look for the new packages today in a variety of cooked and uncooked sizes. The Seafood Department at TOPS always has an incredible array of tempting treats. From raw and uncooked shrimp to live lobsters and lobster tails. We'll even steam and season any raw shrimp FREE with purchase! When you purchase shrimp, lobster, crab clusters or crab legs from the Captain's Choice at TOPS, we'll steam your delicious selection for free! Leave your seafood items with us while you finish the rest of your shopping and pick them up on your way out! It's a great way to get a quick and tasty meal on the table when you’re short on time. Ask a Seafood Associate for details. When you're looking for a quick and easy meal your family is sure to love, check out the ready-to-cook seafood selection at TOPS! We offer a huge variety of prepared items such as crab cakes, stuffed shrimp, stuffed fillets, kabobs and marinated steaks and fillets. All you have to do is cook and serve!